Fuchs North America’s website has always been attractive and filled with relevant content, including nice photos of prepared food items. It’s only natural because Fuchs is a leading maker of seasonings and functional ingredients for some of the world’s biggest food brands. But the existing website had been designed at a time when most B2B customers used desktops rather than mobile devices to research potential sources of supply. That’s all different now. 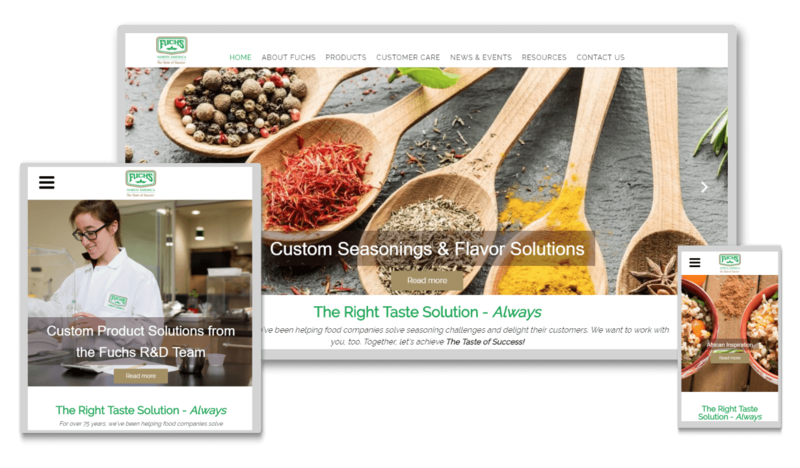 In designing Fuchs’ new web presence, our goal was to ensure a great browsing experience for visitors while continuing to emphasize the company’s ability to work closely with customers to develop custom seasoning blends and flavors used in snack foods, prepared entrees, sauces and other products. We put Fuchs in the driver’s seat by incorporating a user-friendly content management system. We trained Fuchs’ marketing staff members on how to easily perform their own web updates, improving their cost efficiencies.